A journey such as this one is only possible because of the generosity, hospitality and friendship of others we have encountered on the way. We begun our trip with some sketches of possible routes and a few contacts from friends and colleagues of a number of people we came to meet. Between plans and the actuality we initially felt a gulf filled with a sense trepidation and risk, leaving the relative safety and comfort of our lives, our home and jobs into something unknown. What we had not imagined was the warmth and generosity we have encountered and been drawn into in all the places we have visited, the doors that were opened, the food shared, the walks taken, the friendships built. This has been one of the most wonderful and humbling aspects of the journey, the openness with which we have been received and the hospitality those we have met have shown. Maybe it is also because we have ourselves been more open, to people, to situations, to life. Whatever it is, the friendly rapport and genuine exchanges we felt we had with so many people over the last few months has felt truly alive (enlivened!) and quite a world away from the stifled, cautious and awkward dynamics that often unfolded in and around the academic institutions we had been accustomed to. 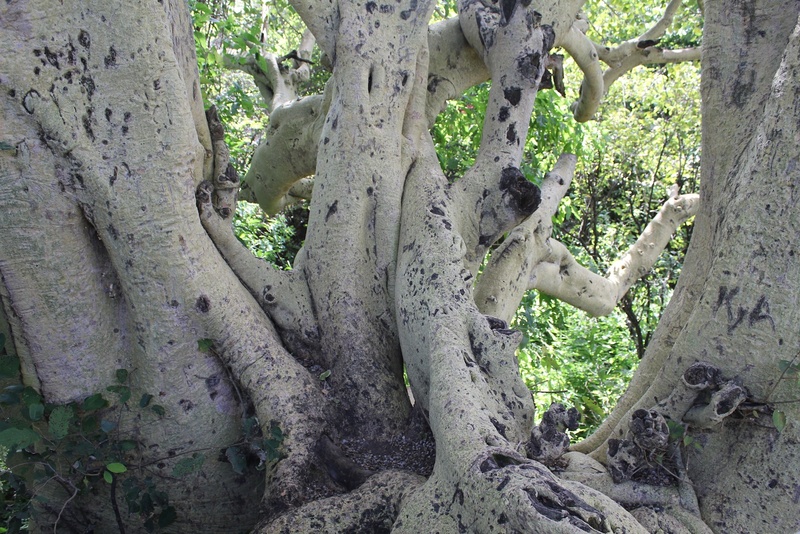 Tepoztlan, Amate tree (ficus insipida – a kind of giant wild fig tree) which we were shown by Alberto. So this post is more of an expression of gratitude, as we start this new year, for the openness we found on the road but also a discovery of the many shapes and forms hospitality takes. The dinners and conversations with Cynthia Chambers, Ramona Big Head, Narcisse Blood and Alvine Mountain Horse. Being guided through ‘the pond’ by Ryan and Adrienne Heavy Head who shared the story of the Beaver Bundle with us. The warm hospitality of our friends Amanda and Sebastien (along with their newborn baby Maeve) in Calgary and the many conversations about the environmental situation in Canada. Being shown around the landscapes, rivers and forests and sites of First Nations art in and around Terrace by Dempsey Bob, and sharing a number of beautiful conversations and meals with him. An unexpected dinner organised last-minute by Rocque in his wonderful house by the lake a few miles south of Terrace. Through the contact of our friend Amanda who Kelly met in Birmingham – staying with her friend Janice, and now our newly found friend, in Vancouver, who introduced us to the world of urban gardening there and the exciting initiatives happening around this at the University of British Columbia with First Nations groups. Then in Mexico staying with my camarada Carlos and Rachel in their flat in the charming and bohemian Coyoacan region of Mexico City, spending hours talking about Mexico, Guatemala, academia, anthropology and food, amongst many other things. Meeting a new friend, Alberto in Tepoztlan, a filmmaker and academic who took us on a wonderful walk around the edges of the town to meet some wonderful trees (see the image above). With our home stay in Oaxaca with the tremendously hospitable Margerita and her husband Hector with whom we also shared stories in a (generously) slow-spoken Spanish over breakfast of tamales and one day for lunch an exquisite Oaxacan mole (one of the seven the city is famous for). Funny how food seems to have so often gone with these enlivening encounters and conversations! Then there was the generosity and friendliness of all the students we met at these different places, those in Ryan and Duane’s class at Red Crow, at the Freda Diesing School, in Unitierra who shared their experiences of being in these spaces. We had already thought and talked much about these wonderful encounters throughout our journey before we reached Oaxaca where we learnt that in the work and life of Gustavo Esteva and Ivan Illich, and in the ethos of Unitierra, these qualities of friendship, hospitality and generosity are also central orientations. As we wrote in a previous post on autonomy, these qualities provide a different perspective to the individualism and self-centredness commonly cultivated in the learning and institutional life of industrial modernity. Illich and Esteva’s writings and their actions instead attempt to show that there are other ways of relating and conducting one’s lives based on these orientations of friendship, generosity and hospitality. We already described in a previous post the atmosphere in Unitierra in respect to this. Here I also want to write a little about our own attempt at creating an environment of generosity in the world of academia.I have a vague memory of reading something somewhere about how the academies of ancient Greece functioned as a meeting of friends to discuss life, ideas, politics. The early scientific and learned societies from the Enlightenment onwards in Europe similarly gathered friends in pursuit of their passion for learning, though like the ancient Greek ones these societies did tend to elitism and where exclusively the privilege of men. Yet how strange that this key quality of friendship seems to have been squeezed out of corridors of the academy, often supplanted by a cold individualism. Whilst living in England we had experimented with a small group of other colleagues from the university with an ‘amateur academic adventurers club’. Amateur because we were engaged in something we loved and enjoyed, as the Latin roots of the word imply, and an adventure’s club because it sounded fun and suggested that the pursuit of ideas and social inquiry can have the quality of an active running forth, an investigation and act of discovery. Within this community, we explored ideas and enquiries we were concerned with, thinking about, pondering over, wanting to explore. Over the course of some 18 months we met every few weeks just to talk about ideas, research projects, questions and dilemmas we had been thinking about in relation to our enquiries. Our only rule was not to talk about the day to day troubles we all faced in the academic environments we were working in: increasing and increasingly redundant bureaucratic controls and procedures, a confining utilitarian and profit-driven logic, growing workloads, decreasing time to pursue our own ideas, enquiries and to research and write, decreasing spaces for collegiality and the exchange of ideas. Anyway, we did not talk about any of that. So we attempted to create a space outside this atmosphere of institutional, and subsequently interpersonal, toxicity which was the opposite, an environment of hospitality, friendship and the nurturance of ideas. Taking turns we came to develop and deepen various themes which were enriching in our own enquiries and enlivening in our sense of the possibility of how a community of friends engaged in the world of ideas and social research could work together in creating and relating and thinking. This environment also became one that gave us strength and solidarity in our day to day working lives reassuring us that another way of doing things is indeed possible. This experiment did not take much, only an intention and effort to be open, generous and hospitable to each other and each others’ ideas and concerns, and some food and drink to go with that. Some six months or so after our last meeting with this group of friends we have found numerous other examples of generosity and hospitality throughout our journey that emerged spontaneously through various encounters or which were being nurtured as part of an organisation’s ethos, such as in Unitierra. What has been beautiful to see is that the orientation of a society of friends in pursuit of learning is still very much around and is found in many places, just there, nearby, awaiting us to go forth, open, to meet them. Hey Annabelle, thanks for your generous comment and reflection in this. It would be wonderful to have more of this spaces and opportunities within academia, what a different place it would be! Any other suggestions of how this might happen? Good luck with your own journey through these spaces and hope you meet generosity and openness on the road. What a wonderful read, Udi–thank you! Very interesting and introspective in terms of the reality of what you had experienced in academia and what you are finding now being in all these different environments with amazingly interesting people!